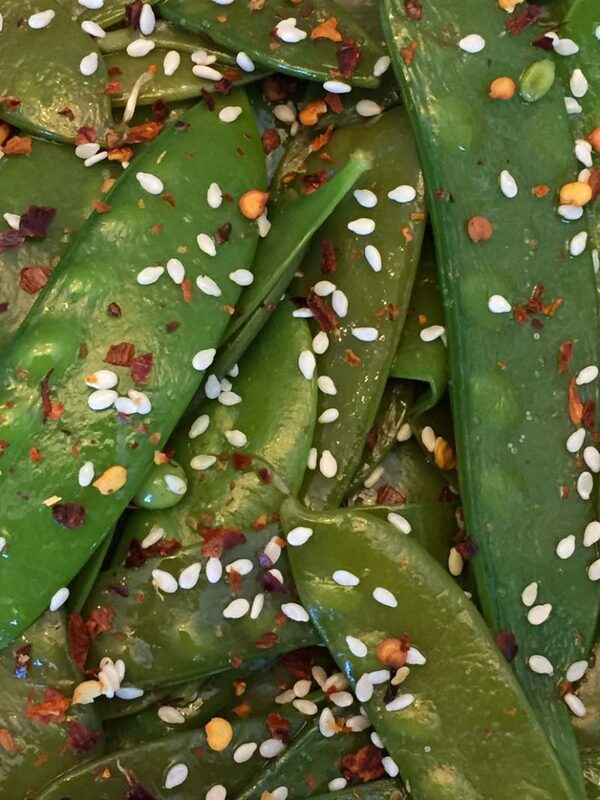 I am in love with this spicy, garlicky take on snow peas! 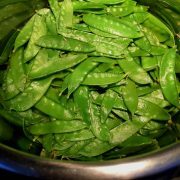 This recipe for Sauteed Snow Peas is flavorful and delicious, exactly what you need in a side dish. 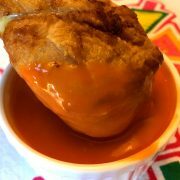 This recipe is at the top of my list. It is beyond amazing and I cannot get enough of all the awesome flavor that is packed into this five minute side. Yup, not only is it amazing to eat, this recipe for Sauteed Snow Peas only takes five minutes! With one bite of these yummy snow peas, you will be cooked. 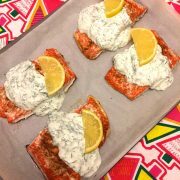 So delicious without being overpowering, this recipe takes only five minutes but tastes like you spent hours in a five-star kitchen. You won’t believe how easy this amazing side is to make in your own kitchen! From start to finish, this recipe will take you only five minutes. Five minutes to something so full of flavor and delicious! Can you believe it?! 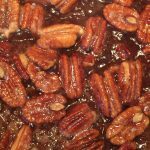 The recipe uses only a few ingredients and takes only two steps. That is all there is to preparing these amazing Sauteed Snow Peas. With preparation this easy, you’ll return to this recipe again and again. I am really loving the combination of flavors in these snow peas. 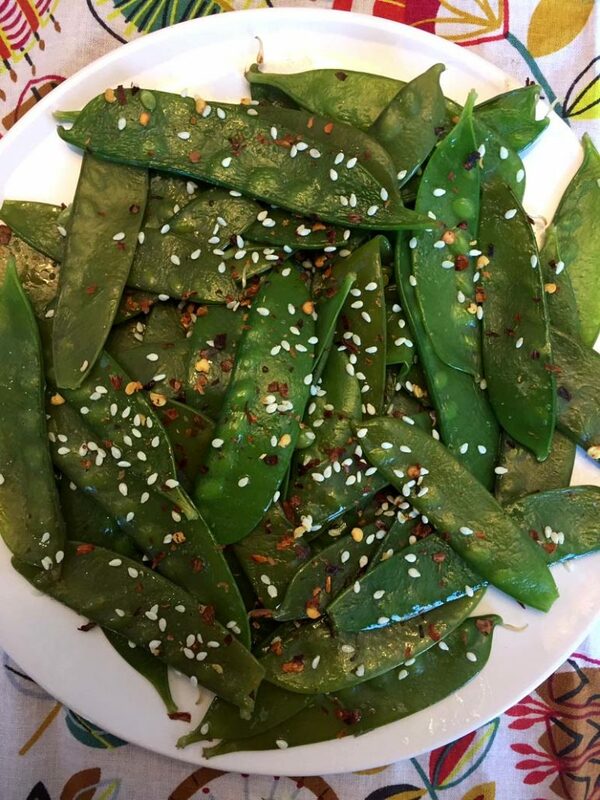 The decadent oil, zesty red pepper flakes, and taste of addicting garlic create such an amazing taste when combined with the sweetness of the snow peas. 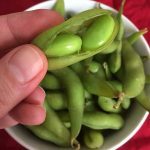 With this Sauteed Snow Peas recipe, you will be amazing by the combination of incredible flavors as soon as they hit your tongue. 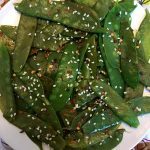 To make this Sauteed Snow Peas recipe, you’ll put your olive oil, garlic, and red pepper flakes in a large non-stick frying pan. Heat over medium heat until the garlic starts to sizzle. I am already salivating thinking about the smell! Add in your snow peas and stir until they are coated coated with oil. Continue to cook the snow peas, stirring every thirty seconds, until they are cooked. This will take about three minutes. 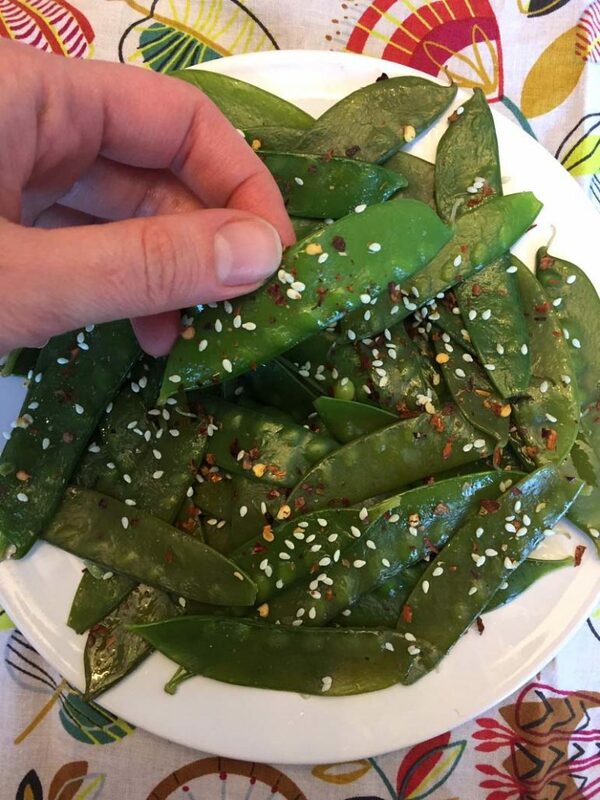 Sprinkle your sauteed snow peas with salt and sesame seed and they are ready to serve! This is a recipe you are going to adore. It’s as easy to prepare as it is flavorful and easy It is great on the side of any Asian dish, but could be paired with so many other meals, too. With just five minutes on your hands, you can whip up these delicious Sauteed Snow Peas and enjoy a flavorful side. I am sure you’ll love them as much as I do. 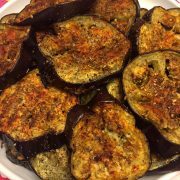 Spicy Garlic Eggplant Slices – these oven roasted eggplant slices are so addictive! Even those who don’t like eggplant devour these! 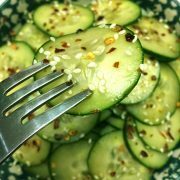 Spicy Sesame Cucumber Salad – crunchy cucumber slices marinated in homemade dressing and sprinkled with chili flakes and sesame seeds! Sesame Honey Bars – made with sesame and sunflower seeds and naturally sweetened with honey, these bars will make you drool! Spicy Garlic Sauteed Spinach – this healthy spinach is so delicious in spicy garlic form! Spicy Whole Roasted Cauliflower – when rubbed with spices and roasted in the oven, this whole cauliflower looks so impressive and tastes so yummy! 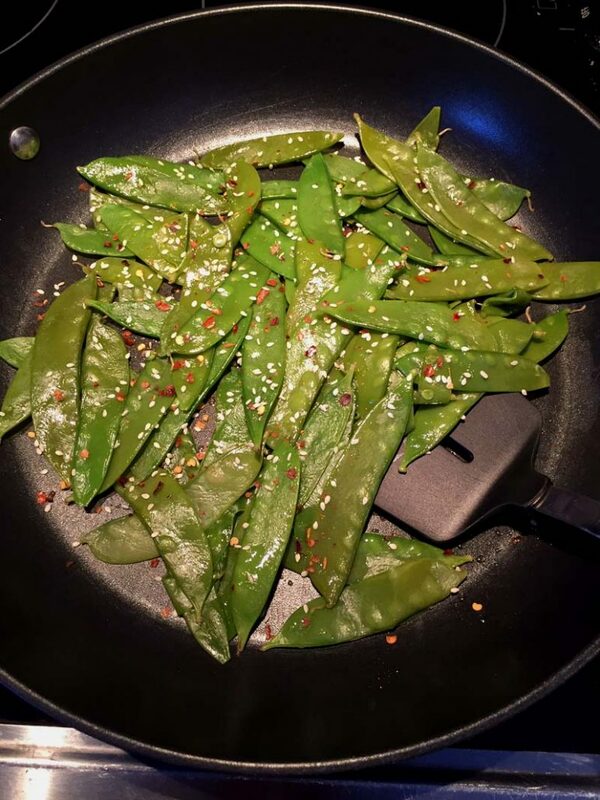 These spicy garlic sesame sauteed snow peas are amazing! 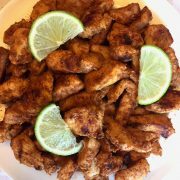 Ready in 5 minutes and so healthy and full of flavor! Put olive oil, sesame oil, garlic and red pepper flakes on a large non-stick frying pan and heat it over medium high heat until garlic sizzles. Add the snow peas and mix until coated with oil. Cook the snow peas, stirring every 30 seconds, for 3 minutes, or until cooked to desired doneness. 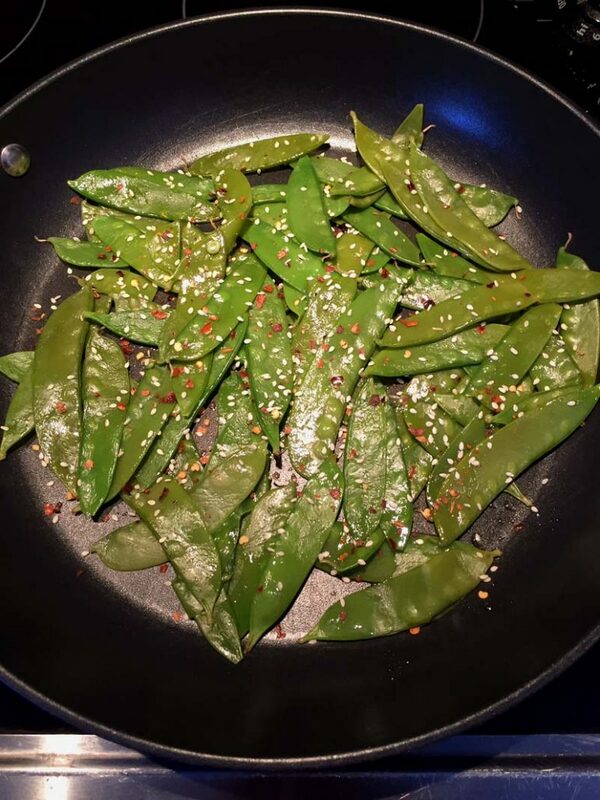 Sprinkle sauteed snow peas with salt and sesame seeds and serve.